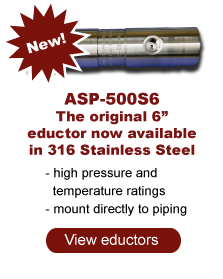 Introducing the new ultra-efficient, low flow aspirator that surpasses the performance of any standard aspirator. Conveniently incorporated into stainless steel tube fitting Tee’s, the Micro-Flo is easily integrated, leak-free, into an analyzer or monitor system. Remote sampling, drawing low pressure process streams and sampling slightly negative pressure process or stack gases is a ‘breeze’ with the Micro-Flo system. 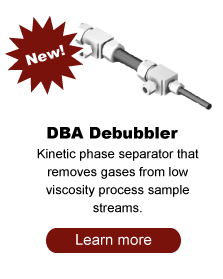 These ultra-efficient aspirators use <5% of the motive air of standard aspirators yet are able to educt samples at a flow rate that will fulfill the majority of sample system requirements. 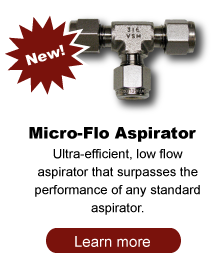 The Micro-Flo aspirator offers ease of operation, simple and inexpensive installation, elimination of maintenance and cost savings in capital and continuous operation. EASE OF OPERATION: For single point analyzer systems (e.g. area monitor, NDIR, oxygen measurement, …) this is a ‘set and forget’ application. A sample flow of 1 LPM is produced with the air pressure set at 10-30 psig. 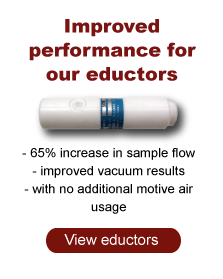 SAVINGS: Air or gas usage is <5% that of standard aspirators. The savings exceed one million SCF of instrument air annually. The Micro-Flo can be used to mix process samples with air at a closely controlled ratio, minimizing the amount of consumed process gas when used as the motive force (e.g. natural gas pipeline). Performance characteristics of the Micro-Flo are illustrated in the following graphs. Extended curves at higher motive pressures available on request.